Faerie Queene is one of my favourite pieces. It’s also the piece I’ve selected to go into the live auction at Splash on September 16. Faerie Queene is stunningly beautiful. Delicate richly coloured Japanese seed beads. Sparkling Swarovski crystals. A gold-filled clasp with extender chain. 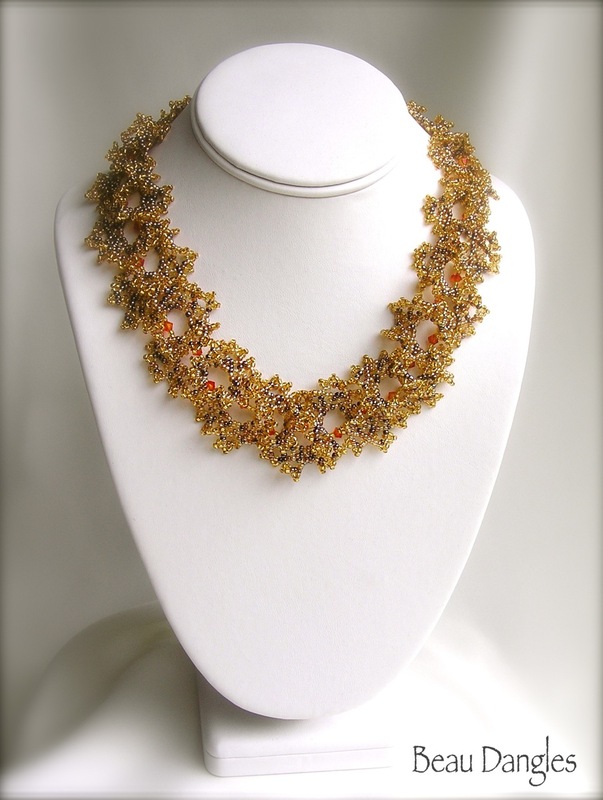 All handwoven into a unique, three-dimensional necklace. It’s truly one-of-a-kind. Splash tickets are still available if you’d like to attend this evening of the arts. Come join us for fun, entertainment and a chance, if you’re so inclined, to bid on some wonderful pieces of Alberta art. I’ll be part of the art show & sale show Friday night and Saturday. (No charge for the Saturday show.) Please stop by and say hello. Categories: Events, Necklaces | Tags: art auction, beadweaving, ogalala stitch, Swarovski | Permalink. I used right angle weave and Fireline. Repeated passes with the thread through the Swarovski crystals ensured good tension and pulled the individual beads together in a snug ball. Categories: Earrings | Tags: right angle weave, Swarovski | Permalink. 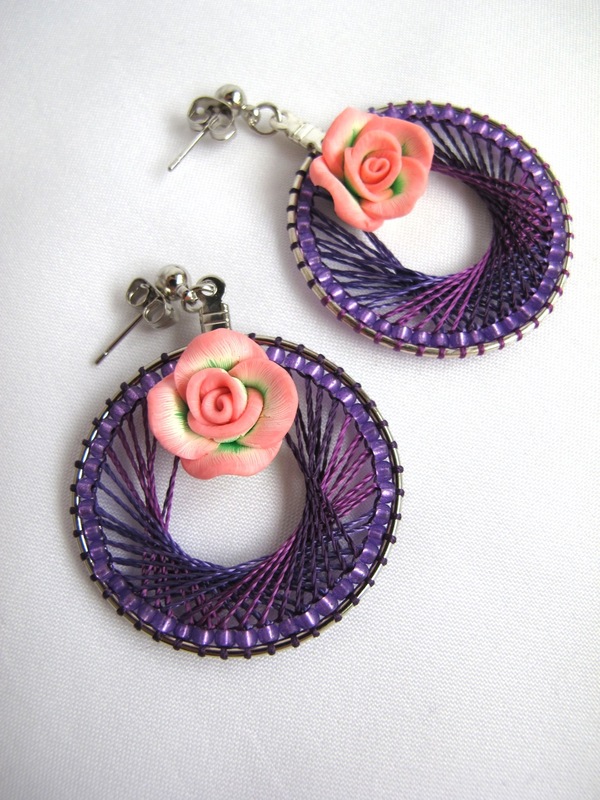 New earrings this week — and for some reason they’re all in shades of pink and purple. Not sure why that happened. 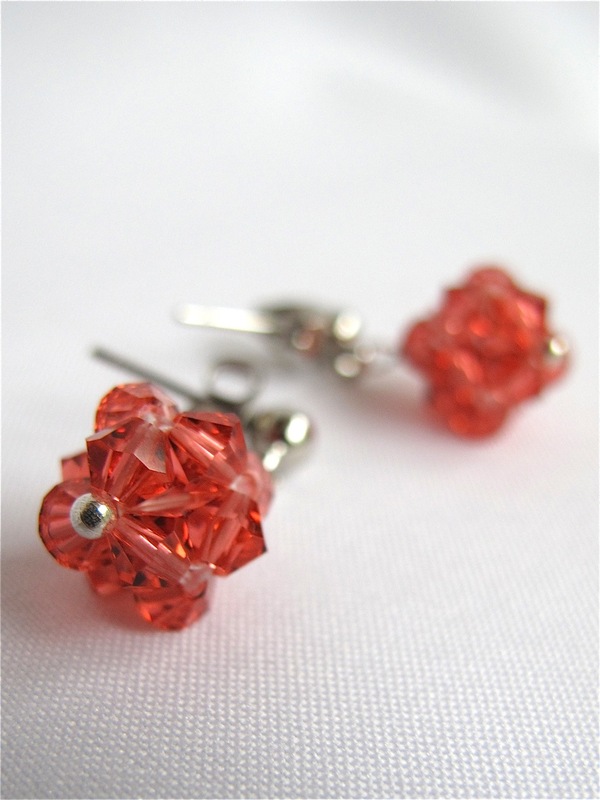 This first pair, done in 3 mm Swarovski crystals, are tiny and very delicate looking. 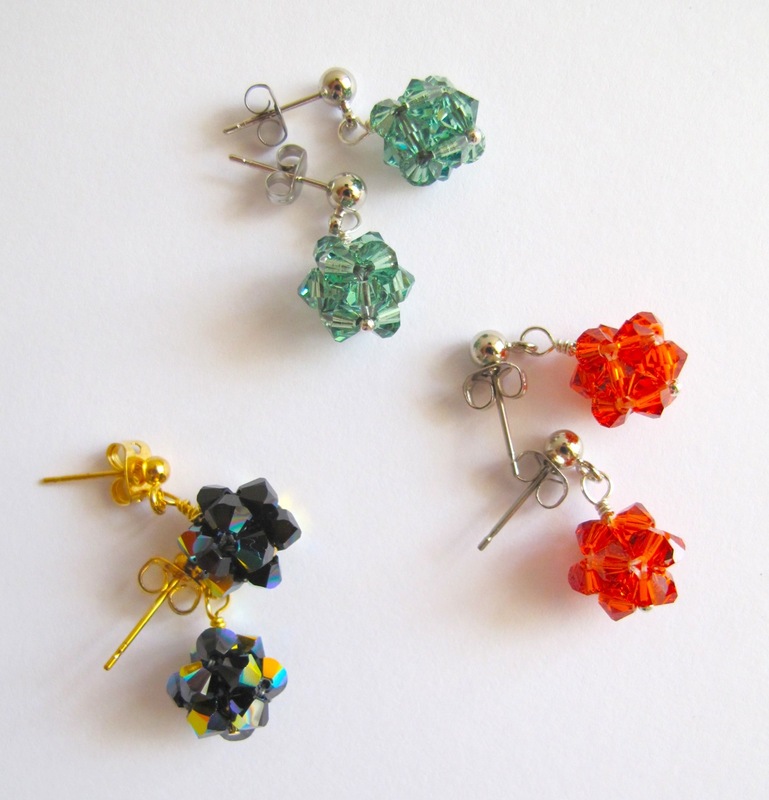 This pair, in 4 mm Swarovskis, are larger but still dainty. Both pairs swing float gently beneath the rhodium-plated posts. The final pair are done in Cherokee weave, one of my most popular designs. The faintly variegated thread pairs nicely with the polymer clay roses. 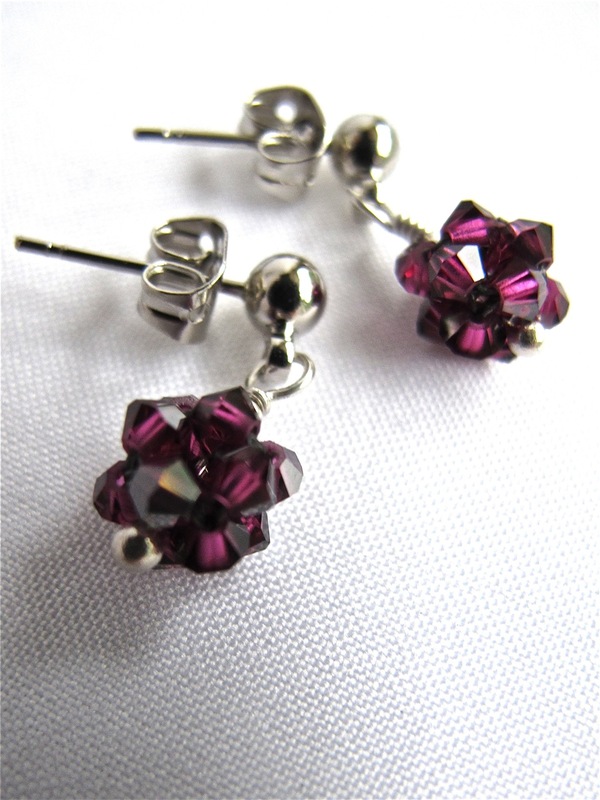 Categories: Earrings | Tags: beadweaving, right angle weave, Swarovski | Permalink. Some time ago I bought a string of 10 pieces of carved stone that the vendor called Australian black jade. Shaped somewhat like a calla lily they were smooth and cool to the touch. I loved them at first sight. But what would I do with them? I wasn’t alone on my foray that winter day — two beadie friends were with me. At the end of our buying spree we poured over our purchases and shared many of our treasures with each other. Five of the black stones went to Lila. She’s an amazing beader and it wasn’t long before she’d worked up her pieces. But mine sat in their original plastic bag. For three years. A few weeks ago I pulled them out once again (something I do regularly with these beauties) and decided it was time. Make something, I said to myself. Anything. And so I did. 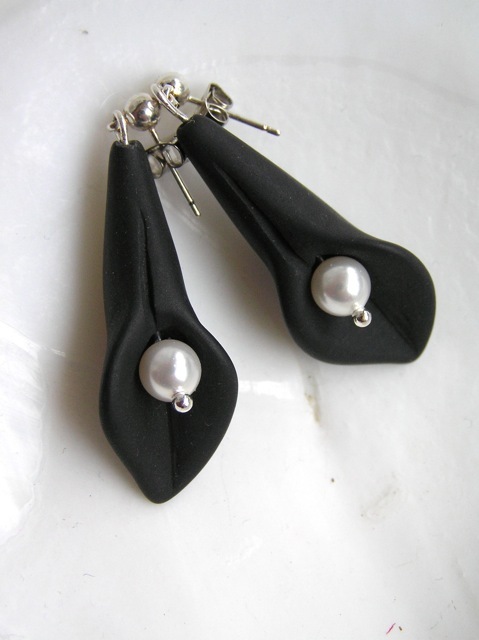 Matched with silky white Swarovski pearls the black jade really came into its own. Categories: Earrings | Tags: Australian Black Jade, Swarovski | Permalink. This is turning out to be a summer filled with shows. I’ve been busy today with earrings. Some have been sitting on my work bench for awhile, in various stages of completion, others were simply waiting for their pictures to be taken. This has been The Year of No Spring aka The Spring of Unending Rain. Great if you’re growing rice or running a fish farm, not so good for gardening, farming or ranching. I’m yearning for a change. Perhaps that’s why several pairs have a summery day-at-the-beach feel to them. Part of me is thinking of warmer times and sunnier climes. Categories: Earrings | Tags: art show, ArtWalk, Swarovski | Permalink.